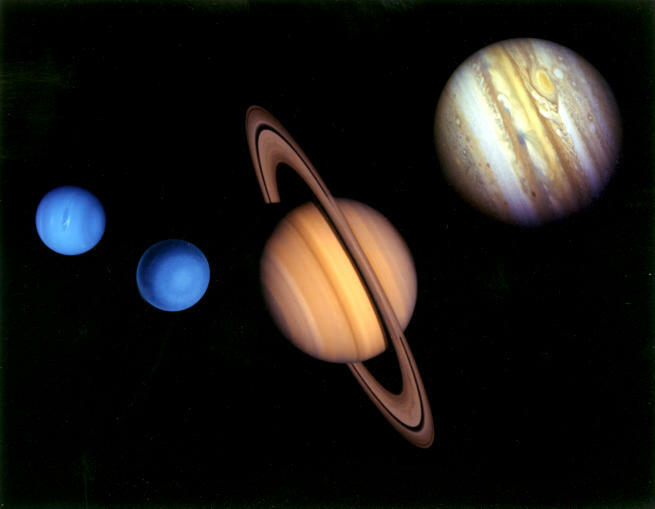 Jupiter, Saturn, Uranus, and Neptune are often called "Gas Giants." They are basically gigantic gas balls compared to Earth and the other three rocky inner planets, or to the icy "dwarf planets" (Main-Belt asteroid Ceres and Pluto and its ice moon Charon, which are also classed as large Edgeworth-Kuiper (E-K) Belt objects). The four giant planets are comprised mostly of an outer layer of molecular hydrogen and helium and a much thicker layer of metallic hydrogen. However, each may have a small solid core as large as three to 20 Earth masses at their center. Sometimes they are called "Jovians" because Saturn, Uranus, and Neptune are considered to be very similar to Jupiter ("Jove" is a variation of Jupiter in Latin). (more on gas giant interiors). 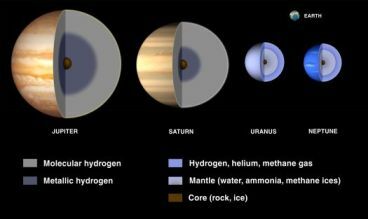 Uranus and Neptune are also called "Ice Giants," although most of their pressurized ices are probably in the form of supercritical fluids rather than the ices found on Earth and Mars (Hofstadter et al, 2008 draft). These two giant planets probably have large fractions of oxygen, carbon, nitrogen, and sulfur -- the next most abundant elements in the Sun and Solar nebula after hydrogen and helium -- relative to Jupiter and Saturn, as solids and gases trapped in water-ice clathrates (Hofstadter et al, 2008 draft; and Ingersoll et al, 2005). According to some planetary models, these two giant planets may have substantial layers of "superionic water" ice under relatively shallow hydrogen and helium atmospheres (in addition to "metallic ice" also found in Jupiter and Saturn), which would explain their unusual non-axisymmetric and non-dipolar, magnetic fields (Stanley and Bloxham, 2006). Simulations in 1999 and an experiment in 2005 suggested that water might undergo a phase change at very high pressures and temperatures below their heavy atmospheric envelopes, where it behaves like both a solid and a liquid because water molecules become ionized and the oxygen ions form a "lattice-like crystal structure" that hydrogen ions flow through like a liquid at high speed (David Shiga, New Scientist, September 2, 2010; Emma Marris, NatureNews, March 22, 2005; Redmer et al, 2010; Goncharov et al, 2005; and Carvazzoni et al, 1999). is also available from the Minor Planet Center. In the several decades old, "bottoms-up" or "core-accretion" model, the primordial disk of gas and dust that coalesced into the planetesimals and formed the planets and other planetary bodies was colder in the outer Solar System, being much farther away from the developing Sun. 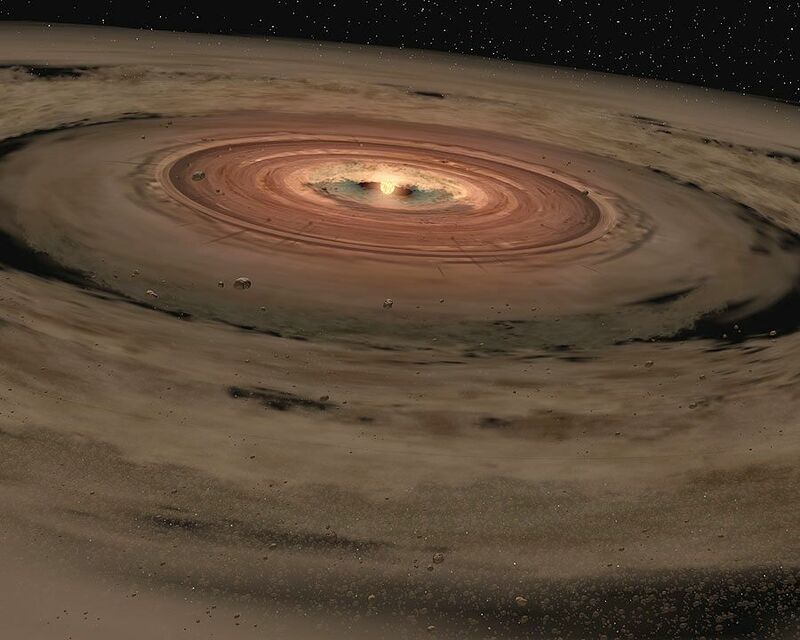 As a result, water and other substances that existed as volatile gases and liquids in the inner nebula were frozen into ices and supplemented the mass of disk materials being accreted into large protoplanets. 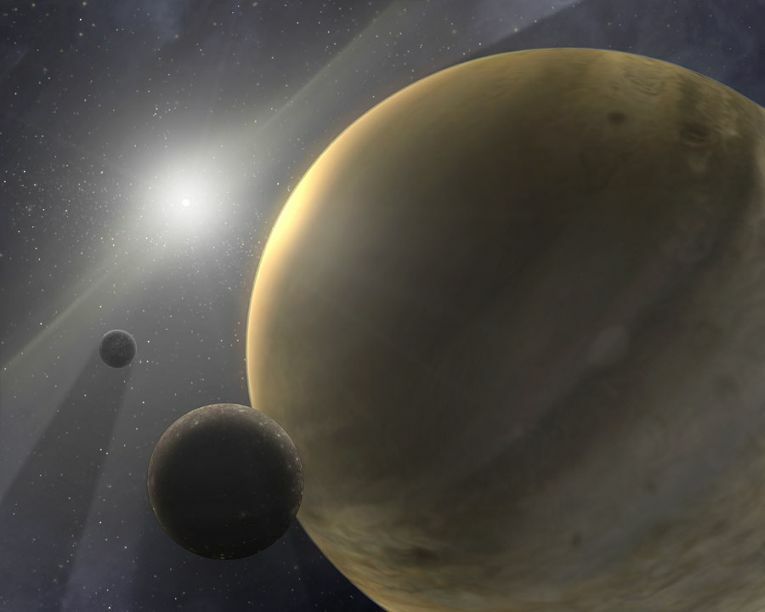 Because of the greater mass concentration from ices available beyond five times the Earth-Sun distance (AU) from Sol, these protoplanets are thought to have grown much more quickly to greater size than those in warmer, inner orbits. Once these ice-rock planetary bodies grew to a critical threshold size somewhere between five to 10 times the mass of the Earth, their gravity became so great that they began to pull in large amounts of gas directly from the surrounding Solar nebula to form giant protoplanets. 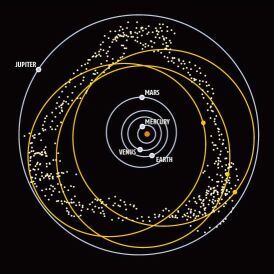 Finally, as happened with the inner planets, the largest protoplanet in each local swarm drew in smaller ones to form the planets now observed through collisions, or threw them out of their original orbits into the Oort Cloud, interstellar space, or into collisions with other Solar System objects such as the Sun. 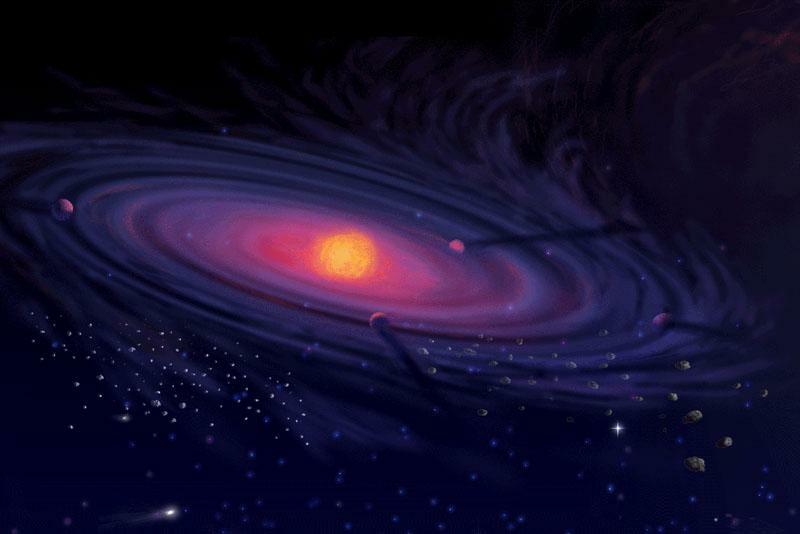 formed quickly from Sol's protoplanetary disk. According to astronomer Alan P. Boss (Astronomy, October 2006), there's little agreement among astronomers on how the largest gas giants in the Solar System (Jupiter and Saturn) and even larger, recently discovered extra-solar giant planets may have formed. According to the "top-down" or "disk-instability" model, concentrations of a protoplanetary disk's hydrogen and helium gas (which makes up most of its mass) can grow by pulling more gas onto themselves through gravitational attraction. 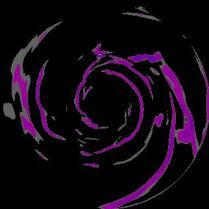 Hence, in a few orbital periods, spiral arms can form and collide within the disk like those in spiral galaxies in a runaway process leading to clumps of gas within a thousand years. If dense amd cool enough, these gas clumps quickly contract and collapse into gas-giant protoplanets which attract dust particles that fall into planetary cores. Between the polar extremes of the tops-down and bottoms-up models, however, astronomers have also developed hybrid mechanisms that incorporate elements of both models (Alan P. Boss, 2007). On January 8, 2007, astronomers using NASA's Spitzer Space Telescope announced their collection of evidence indicating that gas-giant planets either form within the first 10 million years of a Sol-type star's life, or not at all. They conclude that gas giant formation occurs relatively quickly after a star is born, as the lifespan for stars like the Sun with a spectral type around G2 is about 10 billion years. This hypothesis is based on a search for traces of gas around 15 very young Sun-like stars, most with ages ranging from 3 million to 30 million years, where all appear to have less than 10 percent of Jupiter's mass in gas remaining around them. The astronomers also suspect that orbital drag from abundant gas around a star may also be important for nudging rocky inner ("terrestrial") planets like Earth into relatively circular orbits as they form. Using Spitzer's Infrared Spectrometer, the astronomers searched for relatively warm gas in the inner regions of these star systems, in a zone comparable to the region between Earth and Jupiter in the Solar System. They also used ground-based radio telescopes to search for cooler gas in the outer regions of those systems, a zone comparable to the region around Saturn and beyond (Spitzer news release; and Meyer et al, 2006). Their observations were made as part of a Spitzer Legacy Science Program dealing with the Formation and Evolution of Planetary Systems (FEPS). 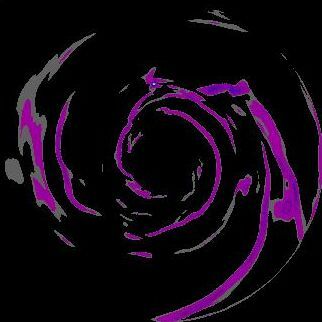 As the gas giants developed, their gravitational pull began to perturb the orbits of the planetesimals in the inner E-K Belt. Neptune began by grabbing many nearby planetesimals from their orbits and passing them to Uranus, which then handed many to Saturn and so on to Jupiter. 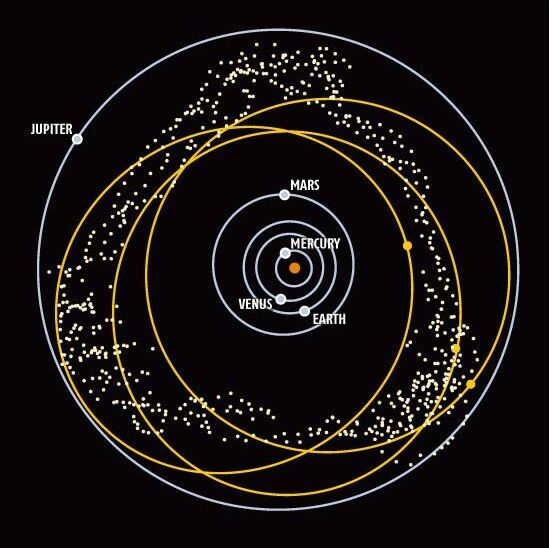 As such planetesimals moved closer towards the Sun into smaller orbits, each lost orbital energy and angular momentum that was absorbed by each passing gas giant. As a result, Neptune, Uranus, and Saturn began to move outward. While Neptune may have moved out as much as 30 percent, however, Jupiter lost orbital energy because it absorbed or ejected the incoming planetesimals in its reach and so its orbit may have shrunk by about two percent from this cause alone (Curtis Rist, Discover, September 2000; and Hahn and Malhotra, 2000). According to computer simulations inspired by the finding of "hot" Jupiter-class planets found in inner orbits around nearby stars, the Solar System's own Jupiter may have formed 10 percent farther from the Sun than it is now, and then spiralled in by about 0.45 AUs (70 million kilometers or 44 million miles) over at least 100,000 years as it lost angular momentum to drag within the thick dust disk that surrounds young stars. In the Grand Tack Scenario, Jupiter moved inward after formation at 3.5 AUs to settle for a while at Mars' orbital distance of 1.5 AUs (before the Red Planet had developed). Subsequent depletion of gas and dust in that region of the circum-Solar disk, however, allowed Jupiter to migrate back outward to their 5.2, and Saturn to around 7 then 9.5 AUs (NASA and GSFC news release; SWRI news release; and Walsh et al, 2011).